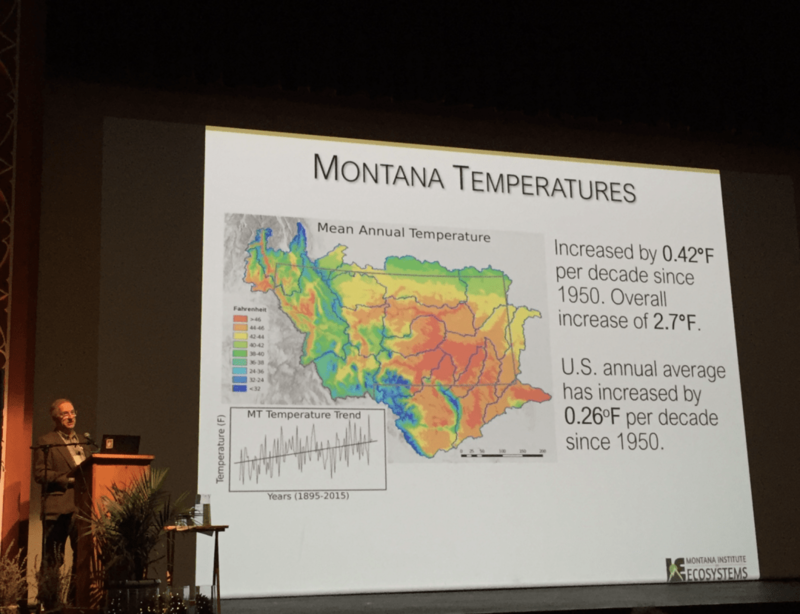 I was sitting toward the front of the darkened Emerson theater, gazing up at a graph that, according to MSU professor Bruce Maxwell, showed the future trajectory of Montana’s temperatures. At that moment, I realized I was entering a new phase of my life. An internal conversation started in that instant; a conversation I assumed I’d begun long before. But like any conversation I don’t actually want to have, it took a flashbulb moment - a reality check - to shock me into recognizing the depth of my disconnection. I’ve been thinking about climate change for years but I haven’t actually felt what it means. Like my own death, climate change is so big, so seemingly abstract, that it lingers perpetually at the edges of my awareness, present but unapproachable. From the stage, Dr. Maxwell patiently described the science of what’s happening to our state and planet. In measured tones, he explained the implications of the graphs and measurements that characterize the climate discussion. Slide after slide, his words carried me closer to the edge of my insular world, nearer to the vertiginous boundaries of my subconscious story that says everything is going to be okay, that “they” will figure something out, that maybe there’s a problem lurking but I can deal with it later. For the first time, my imagination allowed the facts to tell their story. My understanding went from theoretical to visceral as the lurch in my belly announced the arrival of frightening inevitabilities. 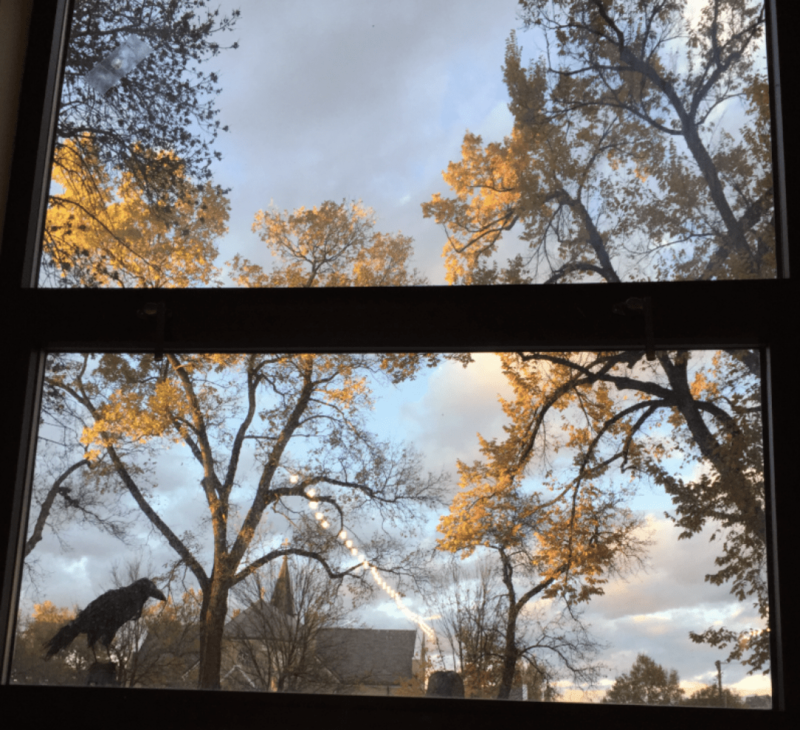 In that quiet moment of clarity at the first annual Faith, Science, and Climate Action Conference, I woke up to the overarching narrative that will define the rest of our lives. For 24 hours, scientists and faith leaders acted as unexpected allies to address what was referred to throughout the conference as the “moral issue of our time.” Through speeches, webinars, breakout groups, lunch-table conversations, and impassioned monologues in the auditorium, the participants opened their caring hearts to the data-informed challenges of our contemporary moment. Faith and science - two potentially-polarized pursuits - converged to tackle a problem that is bigger than the divisions in the human mind. Together, we approached the stark realities of temperature graphs and super-storm predictions and bell curves through the moral imperatives of shared humanity, beginning a discussion that felt quietly revolutionary, if a few decades late. While I learned many facts at the conference, the numbers are nothing new. For a half-century, we’ve been berated with data that claims to reveal human shortsightedness - and on one level, it does. 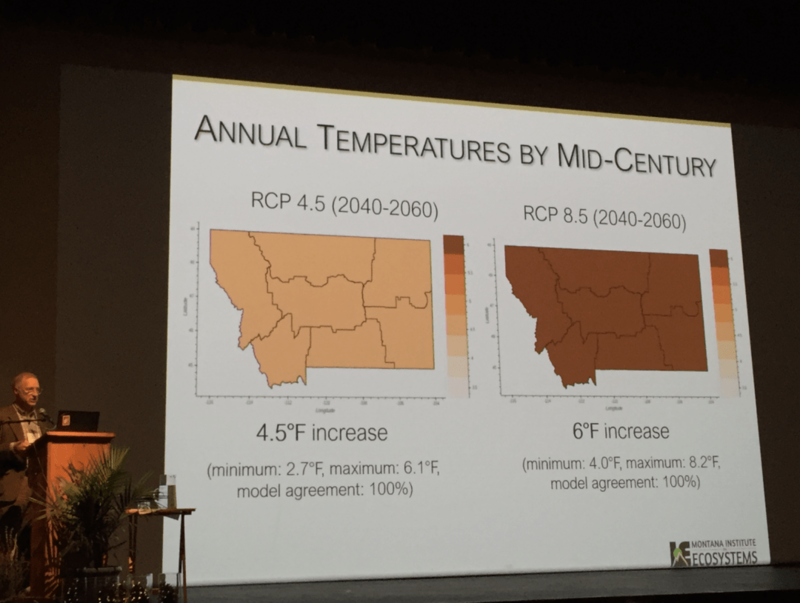 For example, Montana’s average temperature has risen 2.0--3.0 degrees fahrenheit since 1950 and is projected to rise another 5.6--9.8 degrees fahrenheit by midcentury, depending on emissions over the next decade. There’s truth in those digits and I’ve been the red-faced zealot reciting leftist-lines of imminent doom as the energy in the room evaporates. Countless documentaries live in my mind and arm me with a litany of facts that will glaze the eyes of even my most empathic friend. And while this conference provided me with plenty of information, I gained something more valuable. Rather than a new machine gun of data bullets to fire at unsuspecting conversation partners, I left FS&CA with a sense of connection and joy. I wasn’t devoting my day off to learn more about depressing scientific prophecies. As evidenced by the most recent IPCC report, which states we have twelve years to alter our emissions trajectory or face a catastrophic future, shame and terror will not change human behavior in any lasting way. Last week we heard from reputable scientific authorities that we’re living through the most significant moment in modern history and they had the numbers to back it up. After a couple days of headlines, nothing happened. No protests, no emergency broadcasts, not even a tweet from MagaMan. All the data we’ll ever need is pointing out a slow-motion apocalypse and we hardly notice. Clearly, rationality won’t save us, and rationality isn’t what brought me to the conference. The word “faith” means something different to everyone who sincerely relates to it. Within the same religion and even worshipping within the same community, people have totally unique relationships to the sacred. Deeper than quantified disaster scenarios, FS&CA connected all of us in attendance through the invisible thread of the mysterious. It was faith and perhaps a lack of it that carried me through the Emerson’s doors on a snowy Saturday morning to an unquestionable confrontation with my individual helplessness. Faith and hoping to find more made it possible to stare the grim science in the face and still leave inspired to action. As the conference concluded, a little of my cynicism gave way to trust. Like an imperceptible chiropractic adjustment to my soul, sharing the gravity of incarnation’s predicament with other people left me feeling uplifted and cleaned; as though even in this dire moment of cultural crisis, full participation is possible through connection. While the conference was organized and attended mostly by Christians, it opened with a Native American flute player and readings from many different faith traditions. Throughout the weekend, a spirit of deep respect and acknowledgement of other beliefs was abundantly present. It was an open and welcoming atmosphere for those practicing other religions and those who don’t practice anything. As a science-literate Buddhist meditation practitioner who slips in occasional prayers to Jesus and listens to Hindu chanting while reading Sufi poetry, I felt totally at home. To me, faith is a devotional relationship to ordered mystery. It’s a cultivated trust in the way things are whether you call that God’s will, the Dharma, or the laws of thermodynamics. The perfection of Summer’s climax giving way to the first cool breeze of Fall; the intricate calculations that predict all the solar eclipses that ever were or will be; the fact that the sun and moon are the exact same size from Earth’s perspective; a tree simply existing...it’s all an incomprehensible magic trick that inspires utter devotion when I manage to pay attention. And it’s from that place of devotion that the changes we seek take shape. In Buddhism, a basic step is to take refuge in the Three Jewels. The first jewel is the Buddha, which refers to the principle of inherent goodness that is the true core of every human. The second is the Dharma, which means “the way things are” or an unobstructed experience of reality, including the foundation of existence which is impermanence. And the third jewel is the Sangha, which is the community of beings we share our lives and practice with. I love the word “refuge” in this context. That’s what we’re all seeking regardless of our faith background. We’re looking for a way to surrender, to fully join life on its terms. It seems to me that science shares this aim; to understand the way life is and to provide methods of living with what it uncovers. This is what Jesus offers as well; a life of compassionate refuge that continues providing meaning, morality, and faith over 2000 years after its physical termination. It is in fully meeting the reality of life that we encounter the “love that surpasses all knowledge,” our true inheritance and salvation. This is where we will find the courage and connection necessary to face the coming struggles. The Faith, Science, and Climate Action Conference was an example of all three of the jewels, iterations of which exist in many faiths. We experienced the goodness of our care for the world and we faced the potent reality of impermanence in the changes to come. And most importantly, we did that together, as a congregation and community. I suspect it was the sense of togetherness that allowed me to have a paradigm-shifting recognition of what climate change might mean. Alone, the coming changes are too immense to consider. Alone, I shut down. If I believe that I am only an isolated individual, I lose my human inheritance of interbeing. We’re meant to do this life thing together. And while our historical record would indicate otherwise, I posit that we simply haven’t encountered a large enough initiatory event to help us recognize our underlying unity. Climate change, when considered from a faith-based perspective, is an invitation to change in overwhelmingly positive ways. It’s an opportunity to face life as it is and to allow reality a chance to wake us up. This crisis is an unprecedented opportunity to come together, say the things that matter, and feel the unlived life we mistakenly believe we’ll have time for down the road. So whether your life finds meaning through microscopes, prayers, meditation cushions, or quarterly reports, there’s a place at the table for you. See you there.